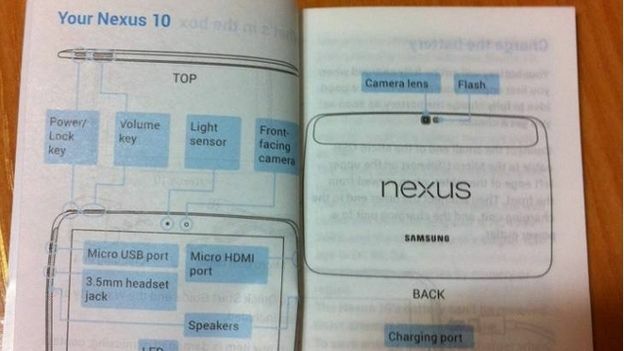 Google will unveil a new iPad-beating tablet next week called the Google Nexus 10, or at least that's according to a leaked manual which shows the Samsung-made tablet as having some rather astonishing specs under the hood. Rumours have suggested that the Nexus 10 will have a 10.1-inch screen with a Retina Display-beating screen resolution of 2560x1600 with 299ppi making it probably the highest-resolution screen on any tablet available today. It's not yet known what will be under the hood but it would be safe to say that Samsung will have equipped it with a quad-core processor, at least 2GB of RAM and the upcoming version of Android known as Key Lime Pie. Alongside this mammoth tablet Google will reportedly be launching a new Nexus 4 smartphone by LG and an updated version of the T3 Award-winning Google Nexus 7 which will feature 3G connectivity and 32GB of storage putting it right in the firing line of Apple's new iPad Mini.